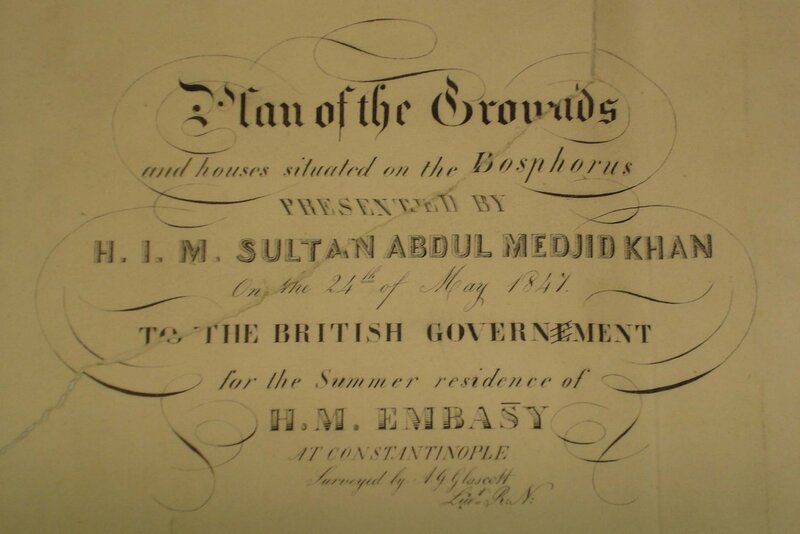 A tradition was established in the eighteenth century of the diplomatic corps following the Sultan from his winter residence in Constantinople to summer residences in the forest of Belgrade and on the Bosphorus. In the early years of the century, the British embassy had its summer residence, comprising a large timber house and a St. George’s chapel, at the village of Belgrade. Lady Mary Wortley Montagu recorded being there with her husband, the ambassador, in 1717. Apparently, daffodils were still growing at the embassy site in the 1950s: perhaps they still are. By the nineteenth century, the village of Therapia, on the west shore of the Bosphorus and about 15 kilometres north-west of Pera, had become a fashionable summer resort on account of the coolness of its breezes from the Black Sea. Princely Greeks had built large timber seashore villas, called yalis, there. The journey from Tophane, on the waterfront below Pera, to Therapia was best undertaken by boat. In 1818, Adam Neale, the embassy’s physician, wrote that he had ‘frequently been rowed from Pera to Terapia, a distance of ten miles, against the current, within the hour’. Subsequent embassies had a succession of caiques and launches that plied between Tophane and Therapia, where they were kept in boathouses in narrow inlets in the quay. 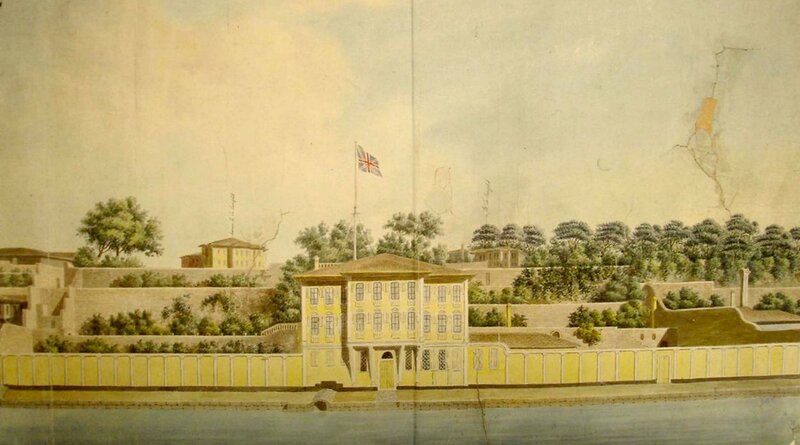 In 1829, the British ambassador, Sir Robert Gordon, was given the use of a house at Tarabya by the Sultan. The deeds to this property were destroyed in the Pera fire of 1831 and Gordon, because he needed to live at Therapia all year round until Pera was rebuilt, anxiously asked the Sultan for a duplicate copy: this was provided under cover of a panegyric of a letter from the Sultan. Some years later, it transpired that this property had originally belonged to some Catholic Armenians from whom the Porte (central Ottoman government) obtained it either by confiscation or a forced sale at the time of persecution of that sect after the Battle of Navarino in 1827. The embarrassed British government therefore handed the property back to the Sultan and the embassy returned to Constantinople as soon as interim premises for it had been leased and readied at Galata by the architect, William Smith, in 1841. 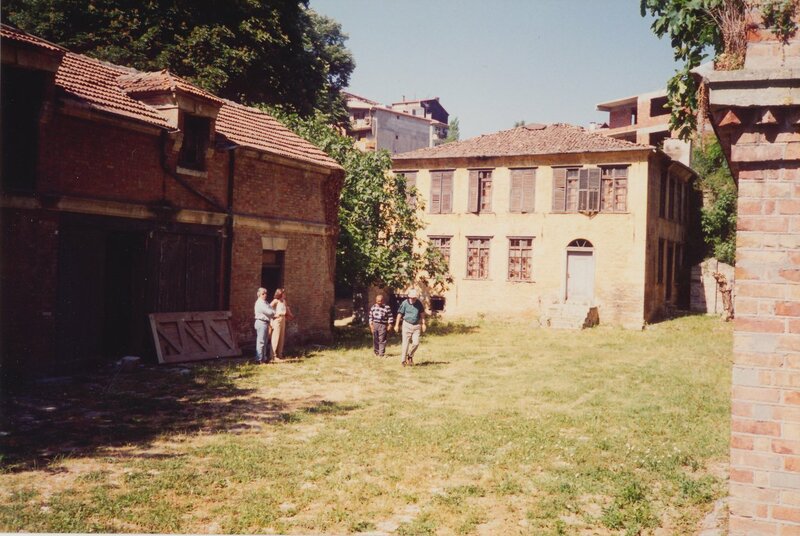 Attention then turned to the preparation of designs for a new British yali at Therapia to be built as a permanent summer residence (on a site that later became the Italian summer residence). Six years later, however, and in honour of Queen Victoria’s birthday on 24 May 1847, Sultan Abdülmecid presented the embassy with another site at Therapia, comprising four yalis and some disused factory/warehouse buildings. The minister, Lord Cowley, in the ambassador’s absence, visited the offered site ten days later. ‘There are three small houses, one only in good repair, and several large factory buildings upon the property. I propose having a plan executed to send to Your Lordship together with a drawing of the exterior by the next steam boat to Southampton’. 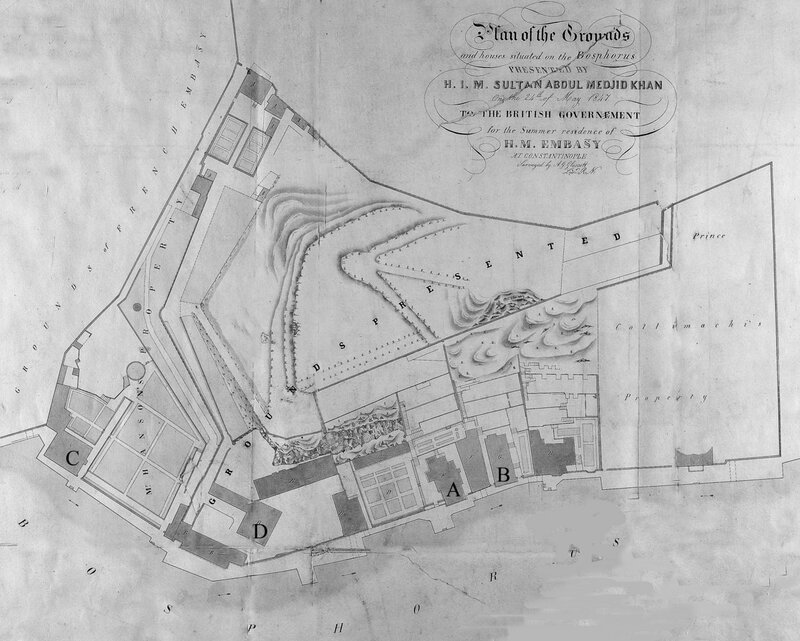 Lieutenant Glascott of the Royal Navy surveyed the site and produced a fine pen and ink plan. Smith drew floorplans of the buildings and reported on their condition. 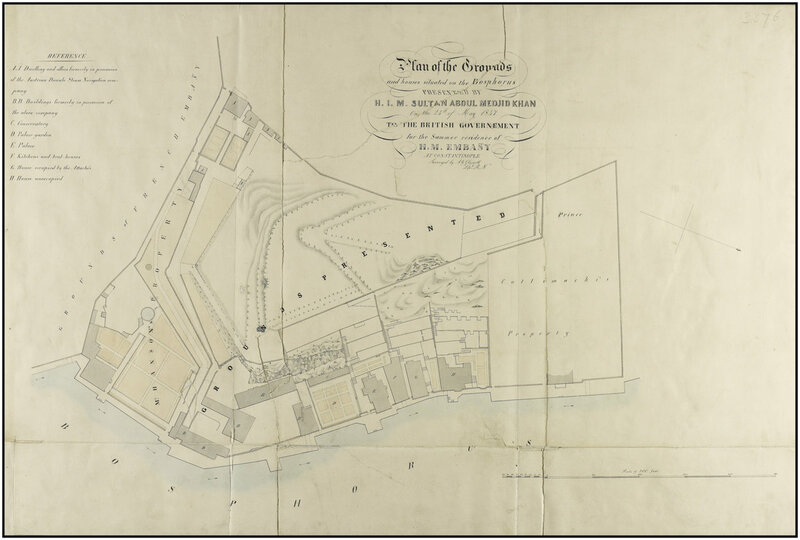 In December 1847, the Grand Vizier proposed an amendment to the site under which a piece of land at the north end, with an unoccupied house on it, would be given up in exchange for a new piece at the south end, marked on the plan as Mr. Hanson’s property. Cowley had ‘no difficulty in agreeing to the proposal in as much as Her Majesty’s Government is a great gainer by the exchange, the house on Mr. Hanson’s property being in excellent repair, with some magnificent timber in the garden, while the ceded part is comparatively of little value’. The granted site comprised about 3.5 hectares, and lay along the roughly north-south shoreline that curved around a shallow promontory. The site is the first on the European shore of the Bosphorus to have a direct line of sight to the Black Sea. It comprised a fairly flat coastal strip, averaging about forty metres deep, between a continuous stone quay along the water and the foot of a huge, steep and wooded hillside that rose up behind. The French summer embassy occupied the adjacent site to the south, on the other side of a small valley, and what became the Russian summer embassy was to the north. From south to north along the strip lay the following buildings: Mr Hanson’s property (C), with a fine garden along the quay; a cluster of four disused factory buildings of the defunct Austrian Danube Steam Navigation Company (D); the garden of the main house, with a conservatory along its west side; the main house itself, referred to as Baltagi’s house, after its former owner (A); a low building of kitchens and boathouses serving the houses on either side; and another house, referred to as the Attaché’s house (B). Inland, up the shallow valley from the factory buildings and at the west corner of the site, lay the steamship company’s dwellings and offices, the best of them called the Stone House. There is evidence to suggest that former ambassadors, possibly including Elgin, had occupied two of the three houses now being offered for different periods during the previous fifty years. In 1805, for example, the summer residence then in use was the house known as Baltagi’s in the 1847 gift; and the house which the Sultan granted to successive ambassadors for their use between 1829 and 1841 was the house known as the Attachés’ in the 1847 gift. Before accepting this gift of land on Her Majesty’s behalf in 1847, Cowley was particularly careful to satisfy himself that the property had been fairly acquired by the Porte. He learned that the greater part of the site had been purchased by the Porte some three years earlier from the Austrian Danube Steam Navigation Company, and that the owners of the three houses had attested to a tribunal that they had accepted the Porte’s offers for their properties of their own free wills: Hanson’s house had been bought for 550,000 piastres, Baltagi’s for 300,000 and the Attachés’ for 105,000. Mr. Hanson left some furniture behind for the use of the Embassy. The combined ground rents would total 500 piastres and would be payable to the evkaf by the British Embassy. Smith arranged some quick repairs in late 1847 to enable Cowley to take up residence in the three-storey Baltagi house, which Edward Lear painted in watercolour in August 1848, during the house’s first full summer season. That summer, too, the stone obelisk recording the gift was probably erected on the hillside. The rather dilapidated Attachés’ house (later known as the Red house) was adapted for occupation by the ambassador’s servants. Hanson’s house accommodated the embassy staff and became known first (and confusingly) as the Attachés’ house and later as the Secretaries’ house. The summer residence became the focus for much visiting and entertaining. During the Crimean War, the village of Therapia itself became a popular English resort, especially with the wives of senior officers fighting in the Crimea. Stratford Canning put his residence at the disposal of Mary Stanley’s nurses, under Florence Nightingale, and a British naval hospital was set up in the village of Therapia. 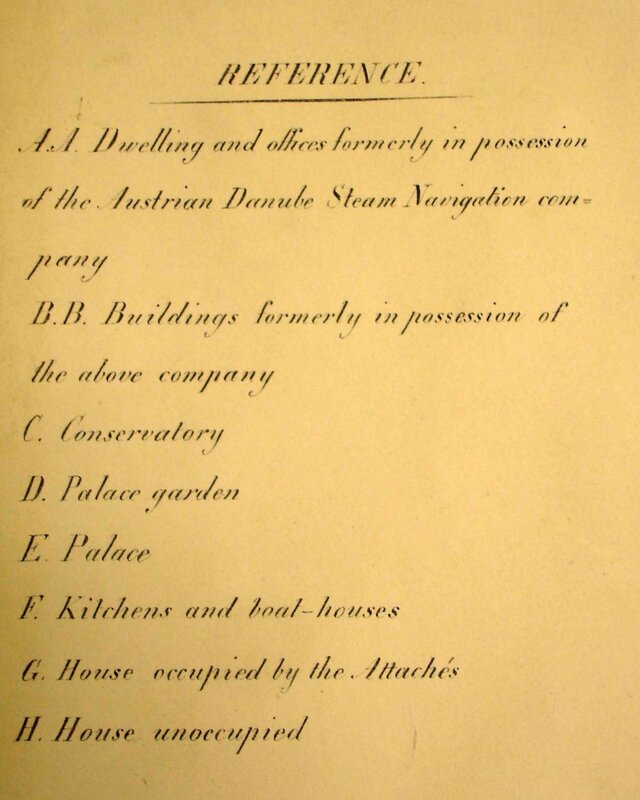 A proposal, before 1847 and by unknown hand, for a new British yali on the Bosphorus. Title of Glascott’s 1847 survey. Detail of main buildings on Glascott survey. The inland Stone House and stabling. 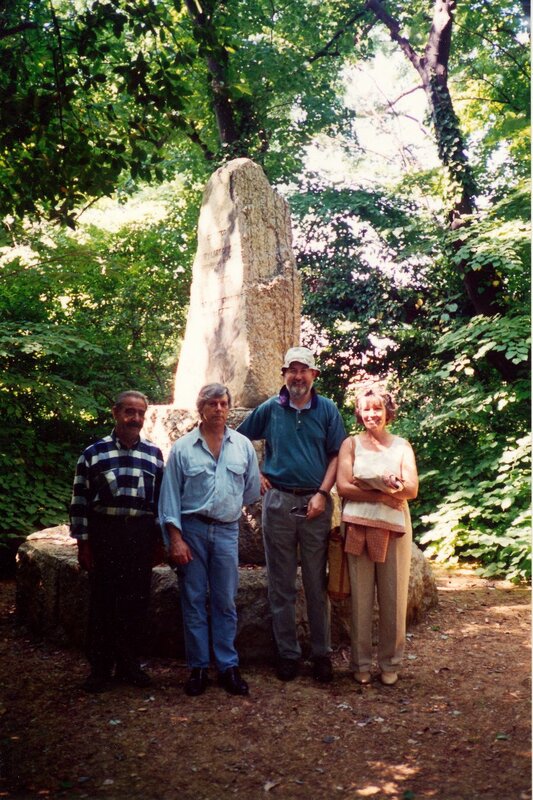 The obelisk, located on the Glascott survey, was later engraved to record the presentation of the site.